JACARÉ was home built 1975 in cedar plywood over a wooden frame. LOA is 6,00 m and beam is 2,0 m.
Total weight is 300 kg and she cannot capsize. Foam blocks assure unsinkability. The boat has a 150 kg steel and lead keel that can be lifted with a removable windlass, therefore I can rest the boat an a ordinary trailer. Mast and spars are original, made from the Brazilian araucaria pine. Many watertigt lockers contain all my belongings. A 5 HP Mercury engine helps me on calm days. 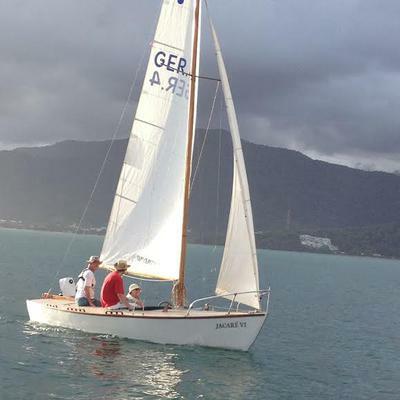 Sail area is about 15 square meters, with a self tacking, roller reefed jib. The boat has a mechanical self steering device, which is very useful when tacking. Mainsail has one reef point. This boat is very fast and handy. 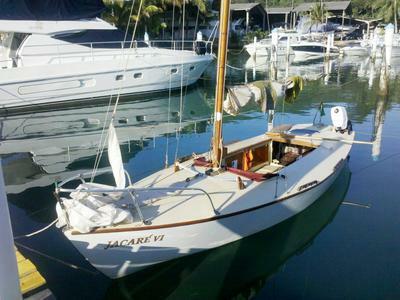 Jacaré is equipped with solar electricity, VHF, fish finder, LED lamps and some other gimmicks. The only disadvantage is the lack of a cabin. At night I buid up a plastic canvas tent wich allows me to stand up. Lively boat. Are plans available? Seems like a very nice boat, not to big and hard to handle, not to small. Its a tropical paradise, the coast of mata Atlantica. Still remember our visit at your parents summerhouse nearly 40 years ago! Looks like the perfect boat for lake sailing.